Here is a list of some of the equipment that I used in my Craftsy Class. If you click on the pictures it will take you to more details about the item. In my opinion, everyone should own the New Bread in Five book. There is nothing better than fresh bread and the smell of fresh bread baking! My family has got to the point that they don’t even want to eat store bought bread in the package anymore. I also have the Cambro’s, dough whisk, wood pizza peel, and the baking steel. We use the olive oil bread recipe for the crust, and our pizza’s turn out amazing on the baking steel which heats evenly and gets super hot. Thanks to all the wonderful equipment listed, our family and friends are always envious of the creations we post on social media. Thanks to all the vendors for developing such fabulous products! So glad you are enjoying all the bread. If you snap it down, and then, during the rising of the dough, the bucket bulges or blows the lid off the top, it was too close to being airtight (or was actually completely airtight). If this bulging or pressure build-up happens, you need to leave the lid open a crack, at least in the first 48 hours of rising. Or punch a pinhole in the lid. Usually, gas production after 48 hours is low enough that this isn’t much of a problem. But never seal glass containers, if you happen to use them, as they can shatter with this pressure. Thank you for the explanation and your prompt response. Looking forward to using your recipes. QUESTION : This List looks useful, but in UK even a few of these would add up to over $1000 ! Can you suggest generic descriptions so I can look for best available here. You don’t have to buy these specific brands, anything like what I’ve showed here will do. If you click through to the products you will get a good sense of what products may work instead. 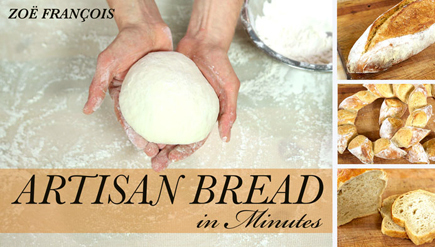 I love this method and wonder if there is a recipe for Ezekiel Bread? We haven’t made one yet, but it is a great idea to try.